Hi. I wanted to share some information about my upcoming workshop. 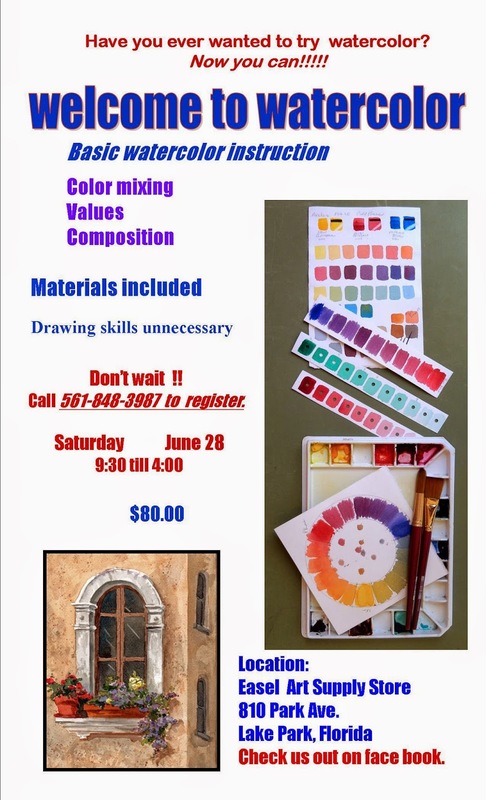 I will be teaching the basics of painting with watercolor. I have been teaching at Easel Art Supply Store in Lake Park for 5 years now and many have asked for a beginning course. All the materials for the workshop will be provided and drawing skills are not needed. I will go over the most important information to successfully use the medium. We will meet from 9:30 till 4:00 on Saturday June 28th at Easel Art in Lake Park, Fl. Please call me at 561-848-3987 to register. There is a $80.00 investment to attend the workshop. You will leave with the inspiration to keep painting and the basic knowledge of how to paint in watercolor.